I’m 29 years old and I’m planning my future with my husband, I’m invincible. Or so I thought. 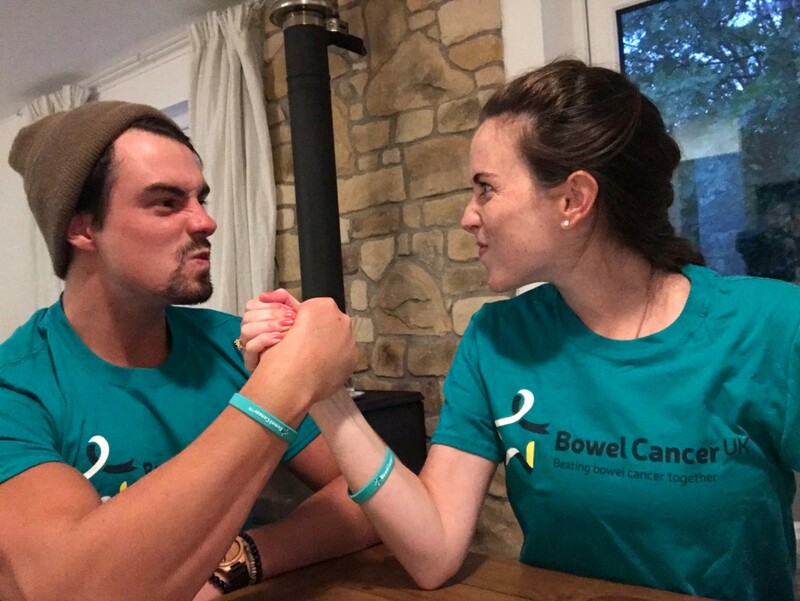 Hearing you have bowel cancer at 29 took a while to sink in. In a weird way though, I felt a sort of relief knowing what was wrong with me. I know that might sound strange, but after two years of having symptoms including; diarrhoea, constipation, blood in my poo, bloating, severe stomach cramps and rapid unexplained weight loss, it felt good to know that I wasn’t going mad. Obviously, not the best diagnosis, but at least I could start to understand why I was feeling like I was and find out how I could get better. And that I believe, is really important, because at no stage have I thought that I’m not going to get better. I am extremely lucky to have a loving husband and family around me. For Sam, my husband, it’s his wife that he has to watch going through this. He’s been here, seen me going through this daily, seen me in the pain that I went through prior to the diagnosis and not been able to take that pain away. For my parents, it’s their little girl and they feel totally helpless. They want to take my place to save me from going through all of this. For my brother, it’s his little sister and he can’t come to terms with why? For me, I feel everything; I am filled with emotions whilst dealing with the physical changes that are happening. But mostly I am scared; scared of the unknown, scared I am not in control. All of a sudden, the only thing that’s going through my head was our future family; Sam and I, and our future as parents, how is this going to be possible? I started going to the doctors with my symptoms about two years ago. My appointments started getting more frequent as the symptoms worsened – towards the end I was at the doctor a few times a month. I saw many GPs and every time it was a new doctor with a new diagnosis: “Sounds like IBS” “Have you tried giving up gluten?” “Do you get this monthly? Could be severe period pains” and even suggested it might be haemorrhoids! I got sent home with a cream! 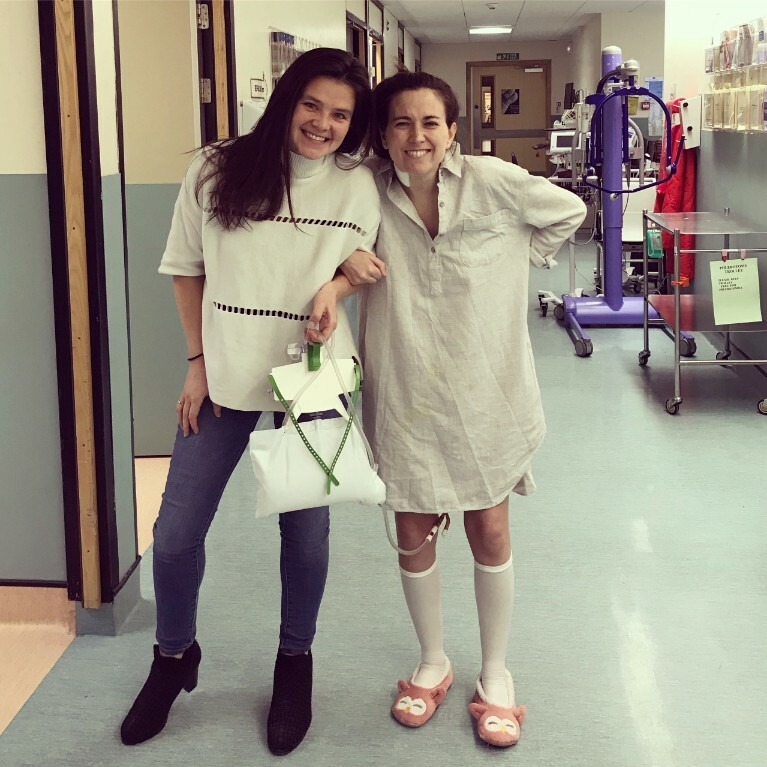 “Here you go love, rub this on your bum, you’ll be grand!” I have never considered myself a wuss when it comes to pain, but the pain I had for the nine months leading up to my diagnosis was unbearable. I found myself cancelling plans with friends and constantly being sent home from work. When you find yourself driving home from work on a regular basis needing to stop to be sick and curl up in unbearable pain – you just know that there is something wrong, something very wrong and it definitely isn’t food intolerance. To start with, I felt frustration towards the GPs that I had seen for the past two years. Why didn’t they listen to me? Did they think I was lying? Did they think I was a hypochondriac? I would do anything to go back in time and do things differently. But then again, I’m not actually sure what I could have done differently. I guess I should have been more belligerent? When you don’t feel well, or you think something is wrong with you/your body, then you go to your GP. You hope that they will be able to tell you what it is, you pray it’s nothing serious and you do what they tell you. Why? Because they are the professionals and you have to trust what they say. 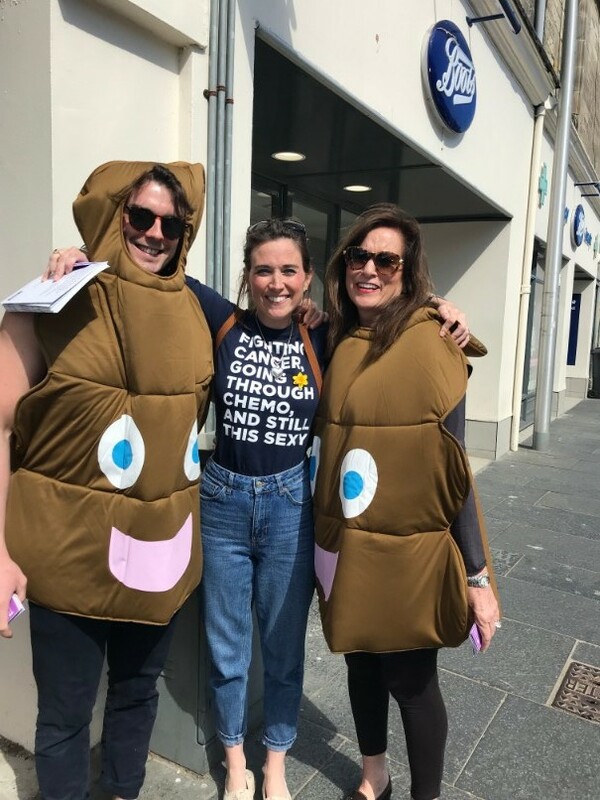 About six months prior to my diagnosis, at one of my many dead-end GP appointments, I anxiously listed off my symptoms- blood in my stool, mind blowing pain, sickness, constipation and diarrhoea, weight loss, however the response was still the same. When you have real symptoms that mirror a type of cancer, no matter how young you are, no assumptions should be made. The response was a little smirk and “No, you don’t have bowel cancer”. It’s difficult to tell this side of the story without sounding like I’ve got a massive bag of salty, bitter vinegar covered, fatty chips on my shoulder. I’m not angry at the GPs as people, and I certainly don’t blame them for my health, I don’t want to de-humanise them, or criticise them. They have such a tricky job – they get treated like oracles, and are expected to know everything, which of course is just not realistic. Throughout my journey I’ve met many lovely, wonderful, very clever, kind and hardworking GPs. However, when you have real symptoms that mirror a type of cancer, no matter how young you are, no assumptions should be made. It should never be dismissed. As a patient, you must be persistent. And I really hope that, if any GPs read this part of the story – and they are ever faced with a patient similar to myself, that they will be slightly more careful. It is better to test for something unlikely so you can rule it out for sure than dismiss the possibility and later find something more sinister, especially if the only missing symptom is that you are under 50! This I understood, this made sense – we were going to beat the cancer. I was so focused on the cancer, I hadn’t thought about any other implications this could cause in the future. It therefore came as a huge shock when the doctor explained that the radiotherapy I was about to undertake would damage my uterus and my ovaries, what does this mean? What I haven’t yet mentioned is that Sam and I had been trying for a baby, at least when I wasn’t curled up in pain. So after finding out that the radiotherapy was going ruin my uterus, starting the egg harvesting treatment straight away was a priority. I must say, I do think that Sam rather enjoyed giving me injections every day! After a week of injections, a few scans, and a few more injections than originally thought, I was told that my eggs were ready to be harvested! I was so excited, it was so good to hear that my body was reacting to the injections. It just felt good that my body was doing something right, something worked! I was clucking all the way to the operating theatre! We were over the moon to find out of the 10 eggs harvested, four of the eggs turned into top quality embryos! In a strange way, it was a good distraction from the cancer, Sam and I planning our future babies. If my story even helps one person to not give up when they think something is wrong, I will feel like I have made a difference. I then started my five weeks of radiotherapy and chemo, however after day four I knew something didn’t feel quite right. After going into hospital and having bloods taken, I found out I had contracted sepsis again. It’s amazing how in tune with your body you become, I just knew something wasn’t right. The doctors soon decided that this route was not working and that they would have to try and operate without reducing the tumour first. There were risks linked to going down the surgical route, including me being inoperable. I was also told that my stoma would more than likely be for life as there wouldn’t be enough bowel left to attach back together after the tumour was removed. After nine hours of surgery, I woke up to be told that the entire tumour had been removed and they managed to attach my bowel back together. SUCCESS! 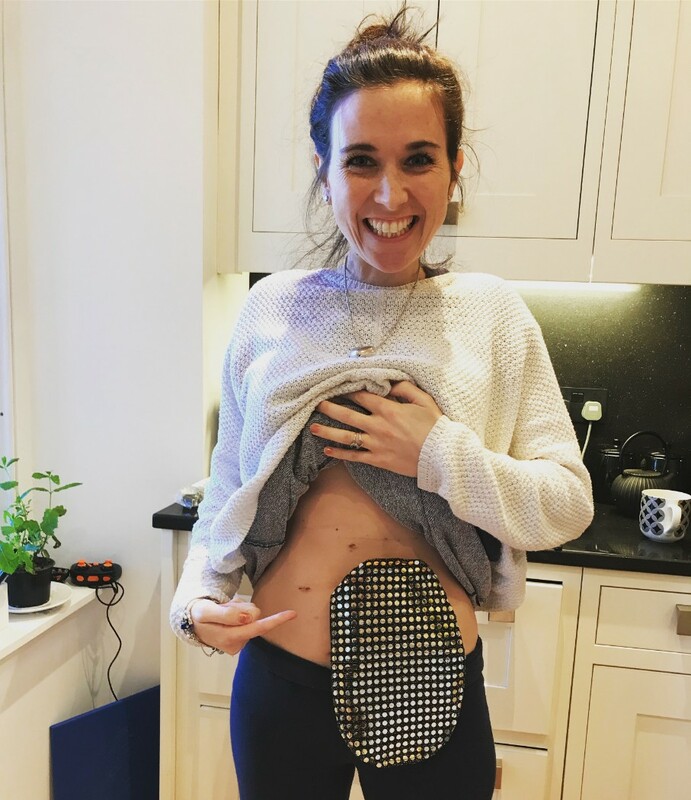 I no longer had a colostomy, I woke to find I had an ileostomy instead (which for those of you who aren’t educated in all things bowel related means it’s from my small bowel instead of my large bowel). I was also told that this would be reversed in the future and I will have full use of my bowel again. There are no words that could explain how grateful I am to my incredible surgeon - Dr Dorin Ziyaie. Recovery was hard, harder than I could have ever imagined. Not just the physical side of things, but mentally. I wasn’t mentally prepared for how I would feel and how much the drugs affected me. The lack of sleep in the hospital started getting to me and I can now see how important sleep is for your mental state, general health and wellbeing, and especially for recovery after major surgery. Fast forward seven months from my diagnosis and I am happy to say that I have recovered very well from my operation. The results from the operation showed that out of 32 lymph nodes taken, two were positive with cancer and these were localised to the tumour - this was a good sign. However, just to make sure that this horrible cancer doesn’t come back, I was told that six cycles of chemo over 12 weeks was necessary. The margins around the tumour were also negative which is great, however just to be sure that the cancer doesn’t come back, the doctors recommended five weeks of radiotherapy in-between the 12 weeks of chemo. As previously explained, radiotherapy would damage my uterus and ovaries and result in early menopause. In order to prevent me going through menopause at 29, we were very lucky to have been offered an operation prior to radiotherapy beginning which involved my ovaries being moved, but it was not without its risks. I decided to go ahead with the operation regardless of the fact that the risks were high that the surgeons may not be able to move my ovaries due to scar tissue from the previous operation. Three hours of surgery resulted in the surgeons successfully managing to move my right ovary. Unfortunately they couldn’t move my left ovary due to the scar tissue, but hopefully by moving one ovary, I should manage to avoid menopause and have eggs for the future in case our embryos don’t work. I feel more determined than ever to recover fully from this, and proud at how much I have got through in only seven months. I want to share my story and help other young people go through what I’ve been through, and most of all to encourage people to listen to their bodies, early diagnosis is key. If my story even helps one person to not give up when they think something is wrong, I will feel like I have made a difference. Because, if I had been listened to, I would have had a simple operation to have this tumour removed two years ago. I would not have faced stage 3 bowel cancer. I would not have had a bulky tumour that required major surgery. I would not have had chemotherapy and radiotherapy treatment. I would not have had to have my eggs harvested and have to go through surrogacy to have children in the future. I would not have required an operation to avoid early menopause. And most of all, I would not have had to have put my husband, my parents, my brother and my family and friends through the worry and fear. Don’t question yourself, listen to your body. I’m glad to say that I have just had my first CT scan and MRI after all of my treatment and there is no cancer in me anymore. The scan did show that I have a very small blood clot on my lung, which means my stoma reversal is pushed back for three months. It’s amazing what you can deal with though. As long as the cancer isn’t back, I’m more than happy to have a stoma for a few more months. I now sit here having finished all of my treatment and feel better than ever. Our next step is to have my stoma reversed in November 2018 - an operation that I am actually excited about! Our next goal - to find a surrogate to carry our baby!